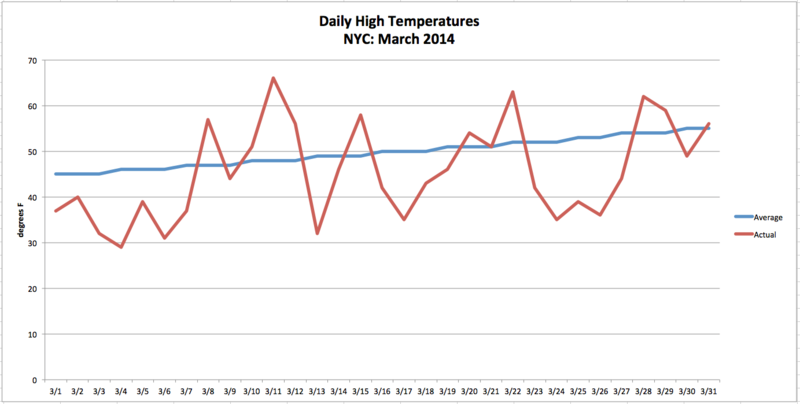 March 2014 was a month of volatile temperature swings in New York City. We had highs ranging between a frosty 29°F and a relatively balmy 66°F. In the end, however, with twenty out of thirty-one days posting cooler than normal readings, the cold won out. The city’s average monthly temperature was 37.7°F, which is 4.3°F below normal. In terms of precipitation, March was mostly dry. The city received 3.67 inches of rain, which is 0.69 inches below normal. Of this total, almost half fell on a single day. Snow was also scarce with a mere 0.1 inches measured in Central Park. On average, the month usually brings the Big Apple 3.6 inches. Closing out NYC’s 7th snowiest winter on record, March was the first time all season that the city received below average snowfall. This entry was posted in weather and tagged nyc, stats by Melissa Fleming. Bookmark the permalink.